I was talking to a friend this week and asked her if she wanted to join me for a yoga class at the studio I love. She said “is there a class for beginners?” “Yes, of course there is, every Sunday, and I will come with you.” She insisted that she is nowhere near the level I would be at, but I ensured her what I know to be true for myself. YOGA is exactly what they call it.. “ a practice.” In every class there are things I feel comfortable with and others that I need to “practice” but some seem to find easy. That is what I love about it. There will always be something to challenge me and keep me coming back for more, even though I have practiced for almost 15 years. The great things is that, if you have ever wanted to try Yoga.. now is the time to do so. There are studios in most neighborhoods coast to coast. The trick is to find one that resonates with you and the type of workout, or feeling you are looking for. Know right off that you will want to take a trial class at a few studios. Most studios have a new student discounted class pass for 5-10 classes and you can enjoy trying all the styles and teachers they employ, for an incredibly low introductory rate. 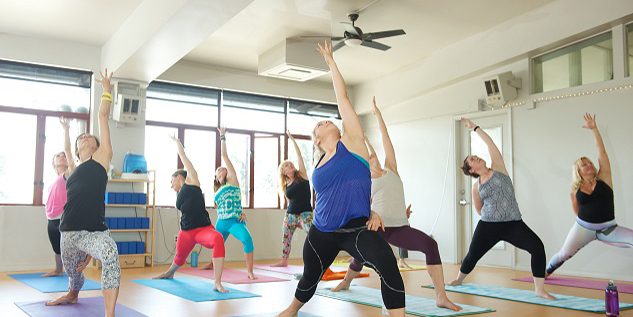 Not only does the variety of yoga differ greatly from studio to studio, but so does the teacher and how they communicate with you during class. Do you want someone to motivate you, push you to your limits, relax you, calm you, inspire you or all of the above? Each teacher brings their own personal touch to the class, and if you don’t love one, move to another, not just another studio, but often another teacher within the same studio can differ greatly in personality and style. They are as different as you and I, so give several a chance. Some studios are very large, where you can sneak in the back and get “lost” in the class where you can learn on your own. Other studios are small, neighborhood boutiques where you get more personal, one-on-one attention. I chose smaller, but you will work harder, as a good teacher will ensure you are doing each pose correctly, give you modifications for injuries or in-flexibilities (even I have that.) To get more attention in a larger studio, introduce yourself as new to each teacher and make your way to the front, they won’t bite. No one is watching YOU, I promise. Yoga is challenging enough for each of us, that all we can do is look into the mirror to focus our attention and balance, versus worrying about what others are doing near us, let alone look like. We all had to be new, and all I “practice” with are very encouraging to one another. Let your teacher guide you and make your practice your own. Yoga for some is a way to get more flexible, or a spiritual/meditation practice of sorts. Here are a few styles of Yoga I have tried, but there are many more. One type is a Vinyasa or Power Vinyasa, a class that tends to be more aerobic in nature – with great core work, Sun salutations, downward dogs, chaturangas (like a push up but with arms tucked back further so you are using your triceps) and more, that tend to be held for shorter times. There are yoga varieties that focus on inversions (being upside down), head/neck stands, and more. Some studios utilize mantras and chanting. There are studios that have acro/partnering yoga classes where you “fly” like you did when your parents used to lay down, have you put your belly on their feet and hold their hands. Forrest Yoga is a modified traditional style perfect for those with spine/neck injuries, as you are guiding through the poses is very gentle and slower paced stress reducing way. This is something I enjoyed when I was recovering from spinal injuries. The studio where I practice even has “candlelight yoga” where you practice at night with candlelight, a slower moving, relaxation yoga. Perfect to get you settled after a busy day, for a good nights rest. There are many other types and forms as well. My favorite these days is Hot Hatha or Bikram yoga that incorporates 26 ancient poses in a room that is 100-104. I never thought it would be, as I melt in any heat.. but once I got used to it (yes it takes about 3+ times to feel more comfortable – I arrive early to acclimate and bring a water bottle!) I found that it forces me to clear my mind and let go of anything in my ‘outside’ world and focus inward on my breathing, balancing & stretching, and nothing else.. which with my busy schedule is exactly what I need. Me time. I wanted to share with you something my wonderful teacher Danielle Z. of Fruition Yoga, said during our class Monday while we were relaxing after a challenging pose in savasana (laying still on the floor.. the best pose ever.) To practice Yoga is to practice Tapas, sanskrit for “Discipline. Ardor. Fire. Literally to transform. Purification through persistence!” This really resonated with me and reminded me that we all have the opportunity to grow and transform through the disciplined practice of yoga. Put yourself out there, and give it a try. What’s the worst that can happen, you will be inspired, relax a bit, stretch and be inspired! You will be glad you did. 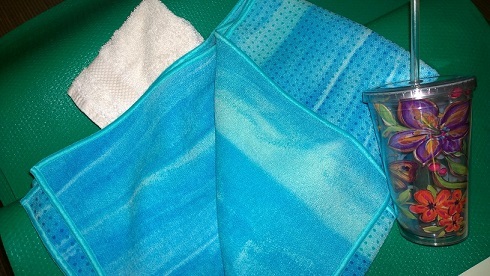 Yoga supplies: Yoga mat, water glass/bottle, yoga mat towel (for hot yoga), wash cloth for face (if would like during class.) *Most studios have yoga blocks, straps and other tools they utilize in class, to borrow. IF you are new to yoga, you can rent a mat and/towel at most studios, to see if you like it before you invest.. but I use my older mats for many purposes. Stretching at home, under my bike trainer to spare my floor of marks, under my free weights, etc. *If you are ever in the Seattle area, give Fruition Yoga Seattle a try, you might see me in a class, challenged and enjoying every minute of it! 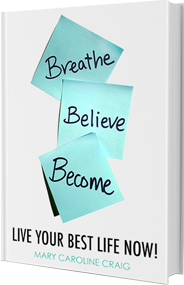 Remember to keep BREATHING & BELIEVING. The sooner you get out of your “Comfort Zone” the sooner you will begin to grow! Is Your “Team” Supporting You?